I really wish I could properly put in to words my frustration with the finance department. They've put in rules that are so convoluted that it is literally impossible to follow them. The doorbell company that I believe you previously mentioned made headlines this morning ! Manager, 2 hours later: Hey, can you do this operational support? I am the most expensive desktop technician in the entire world. I have a guy who bought a 4 year VM ten years ago who doesn't understand why he has to pay for a new one. Can't wait to ditch this Hughes Net that AT&T stuck me with and switch back to Xfinity. AT&T and Hughes Net have BOTH been HORRIBLE services to deal with. I had issues with AT&Ts DSL and tried to get the Uverse instead. It was nothing but excuse after excuse why Uverse is NOT available in my area. Well now, how in the HELL does two of my neighbors have it, one of which is right next door?!.. As for Hughes Net, my phone on 2G is WAYY faster than that BS of a (dis)service. AT&T just lost a customer. Last edited by Outlaw Star; 02-19-2019 at 03:44 PM. I had AT&T for about 3 months and never had working internet. Tech after tech came out and said it was working fine but could never get anything over 3 mbs and only sometimes. Needless to say, I cancelled as well. Sadly the only other internet option I have is Charter. Guess I live too far away from the main city to get anything else. 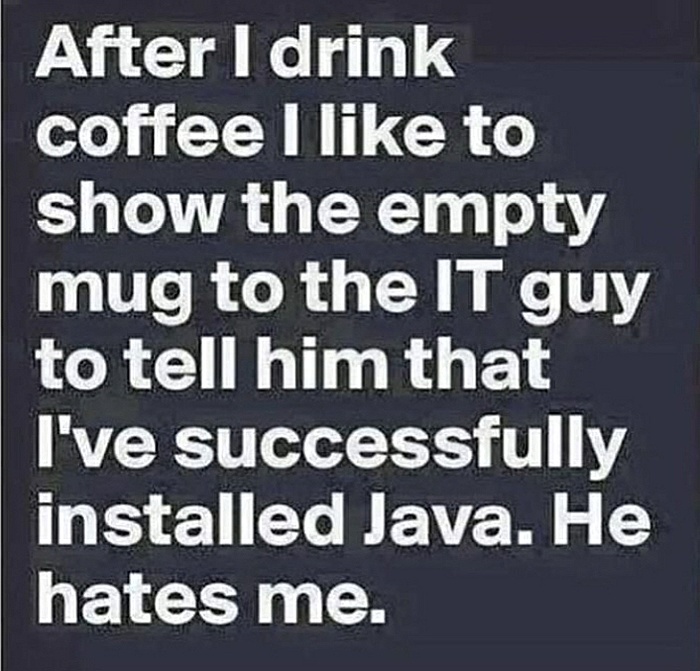 Here's a morning chuckle for you tech-heads. Director: I want to move the TLA application from one part of the datacenter to this other part of the datacenter. What are the implications of that? Me: I am not familiar with TLA, but right off the bat I can tell you that where it sits now DRs to one side of the country and where you want to move it to DRs to the other side of the country. Director: Ok great, I am going to set up a meeting with the TLA team. Who else from corporate should I invite? Me, out loud: ...but Jan and Mike would be a good place to start. On Linux servers with their text-based log files and Unix text-processing utilities (grep, etc.) it is trivial, once Samba auditing is enabled, to search for who deleted a particular file or directory over the network if something needs to be traced back due to a problem. Free or low-cost is going to mean you're writing some powershell. I know the service contracts on those 83 blades have expired. They've been replaced. It's not an error. Please stop emailing me every day, once per server, to tell me that I don't have a maintenance contract on servers that are no longer in service. The guy that kicked you out of a fortune 100 datacenter because you are a bag of dicks. "Here is your 'Please God Don't Leave' raise for 2019." It was significant from a pure dollar amount perspective, and for some reason most of the folks on my team did not get raises this year. Unfortunately for them, I was on the conference call last week where the HR boss said they are now offering 25% more to new candidates. Current employees are limited to 13% yearly raises, no matter what. So if you had a job that paid $50,000 and you were able to qualify for a job that paid $100,000....you would get paid $56,500 for that $100,000 job, maximum. But a new hire? They would have been offered $85,000 for that job last year and now will be offered $105,000. I am, in fact, polishing my resume right now. Thanks for asking. Quick Reply: The IT BS Thread!